A staple in any woodworker or carpenter's shop is the table saw. It's typically one of the top five recommended tools one should have in their workshop. It's easy to see why -- they are versatile tools and can rip or cut boards of any length and dimension. Some tools, like a compound miter saw excel at what they do, but are limited in the scope of what they can accomplish. The table saw is capable of cutting a sheet of plywood as readily as making dados, tenons or box joints. Before buying a table saw you need to decide what type you need. Table saws are generally classified into three types: benchtop; portable (or contractor); and stationary. The benchtop saw is aptly named because its a small saw that can sit on your workbench and have a ten inch blade. They are okay for small projects but are limited in what they can accomplish because of their smaller tabletop, lack of horsepower for cutting larger pieces of wood, and less accurate fences. The portable or contractor table saw is mid sized and a compromise between the larger stationary saws and the benchtop ones. The portable saw category is currently the most popular segment and manufacturers have targeted this space with many different products. These saws will have the horsepower to cut thicker hardwoods and have improved fences and slightly larger tabletops. To make them portable, they often make parts out of plastic or other lightweight material. The improved quality and features from the benchtop models, without sacrificing the necessary space of a stationary saw, are a prime examples why portable saws are so popular. The stationary saw is understandably the largest of the saws and is the Cadillac of table saws. They have the power, tabletop size and accuracy that can't be beat. Their larger size and weight helps produce less vibration making cuts more accurate as well. All this comes at a price though. For a stationary saw you typically will need to have plenty of room, the structural support in the floor (they can run 500lbs or more), and electrical capacity (often have 220V, single phase requirements). You'll also need to make sure you can get the saw in through any doors! These requirements often rule out the stationary, or cabinet saws, for many even when that's what they'd really like. If you don't have a dedicated workshop or are squeezing your shop in your garage where you need to move your tools around then I'd recommend a portable or contractor table saw. These saws offer enough features and provide enough accuracy that you won't be cursing the tool or constantly longing for a larger saw. By now you've hopefully figured out what type of saw you want. So where should you get one? Many people opt to buy new table saws, but if you are willing to make an effort, one can find a great deal buying a used table saw. There's just a few things you need to do to make sure you get a decent one. Why buy a used table saw? You can get a saw at a fraction of the retail price of a new one and take advantage of another woodworker's upgrade to a new saw, an estate sale or whatever reason they're parting with it. Unless someone is really hard on their tools, it's generally tough to ruin a table saw so that it's no longer usable. There are a few parts you can replace to make the saw run as smoothly as a new one. Think of the benefit of rescuing the saw from the landfill too! First, you can replace the blade with a new narrow kerf blade (like the Forrest Woodworker II) or perhaps it just needs a cleaning (try laundry detergent or oven cleaner). I wouldn't recommend sharpening the blade unless you know what you are doing. They last thing you want is the teeth to be flying out when you're running the saw because of improperly filed teeth! If the fences are beat up, you can find many after-market fences and miter fences available. Incra and Biesemeyer fences are among the most popular and can, in many cases, provide a more accurate fence than the one that originally came with the saw. Lastly, although a little more complicated, is replacing the belt that drives the blade from the motor. Slight surface rust can be removed with some rust removal and elbow grease. If you clean of rust from the tabletop, make sure you wipe it down with some paste wax to prevent it from rusting again and provide a slick surface for the wood to move over. When buying a used table saw, never purchase it without testing it out or getting a guarantee that it can be returned if it doesn't operate properly. You'll want to bring eye protection, ear protection, a flashlight, square, protractor and a scrap piece of hardwood, preferably at least a full inch thick -- thicker would be better. It wouldn't hurt to bring a brand new saw blade with you too. These things will make sure the saw is accurate and powerful enough to be useful. We'll first check to see if the blade tracks evenly using a square. The square you'll want is also known as an engineer square, precision square or double square. I recommend a high quality one, like a Starrett 13A Double Square, so that you can rely on it giving you accurate information. Cheaper ones aren't machined with enough accuracy to provide measurements you can trust. On the table saw, adjust the blade up to the maximum height and at zero degrees. Next, place the base of the square on the table top and push it up against the saw blade. Take your flashlight and put it behind the square an see if you can see any light shining through along the height of the square. If you do, try adjusting the angle and try again. Once you have success with this, take a marker or crayon and draw on the top tooth of the blade. Without moving the square, start to slowly rotate the blade around, keeping an eye one the square to see if any light shines through. Keep on rotating the blade until you see your mark on the top tooth -- then you'll know you've rotate through the entire blade. If it moves the square or you see light shining through don't get the saw. It's an indicator that the arbor isn't accurate -- it could have been like that from the start or impacted and bent. To be fair, you should replace the blade with the brand new one you brought so you can be sure it's not a bent or damaged blade. You'll also confirm that the arbor nut can be easily removed and provide inspection of the threads on the arbor bolt. Repeat this process, but use the fence as a guide and make sure that the distance doesn't change over the full rotation. Do this from the front and the rear of the saw blade. Next, rotate the blade to various angles and validate the reading of the angle from the table saw to the protractor that you have measuring the real angle from the blade to the saw's table top. Take at least 5 readings and see how accurate they are throughout the test. If they are accurate throughout, then great. 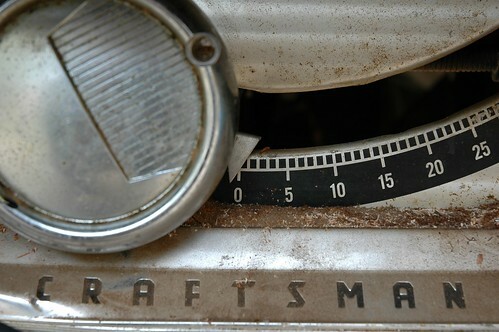 Otherwise, you'll want to check to see if you can easily remap what the saw reads and what it actually is. Remember, you'll probably be cutting things at angles often so you'll want to be able to trust what the saw's reading says. If it's not completely accurate, then your level of acceptance or ability to remap them properly will have to weigh into buying the saw or negotiating a lower price. Finally, you need to take the saw for a spin. Make sure all the safety mechanisms and guards are in place, the blades properly tightened (this is a good time to put on your new blade). Read about table saw safety and how to use a table before operating it since you're responsible for your own safety. You'll need to be comfortable running the saw or don't attempt to do so! Set up the miter, raise the blade to slightly above the height of the wood and cut off a piece. The saw should be able to run through it smoothly without bogging down or burning the wood (maple can burn easily so a few marks would be okay). Sometimes a motor could have a burned out windings or some other problem causing slowdown and lack of horsepower. If it experiences trouble cutting the wood, skip the saw -- it's easier to find a trouble-free one than fixing one. After all those checks you're ready to plop down the cash! You know you're getting a decent saw and the only thing left to do is to practice your negotiating skills. That's half of the fun of buying stuff used, isn't it? Great detailed advice! Thanks ! Great article! I'm pretty set on trying to find a used hybrid or cabinet saw. I'm looking to spend between $700 and $1200. The biggest question I have is where to start looking for a used saw like this. Especially since the location of the saw will have a huge impact on its value. 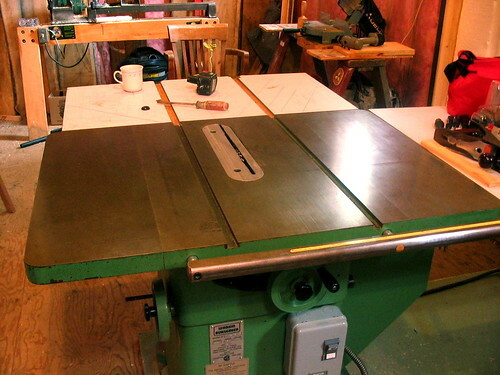 Any thoughts on where to look for a used table saw via location? I would start with Craigslist if there's one local to your area. The other good place to look would be estate sales!